High Crag forms the dramatic eastern end to the High Stile range. The main bulk of the fell forms a pyramid, with steep sides facing south into Ennerdale, north-east towards Warnscale Bottom and north-west to Burtness Comb. The impressive northern face is topped with crags that rise over 1,000ft in about a quarter of a mile, and even the lower slopes rise a similar distance in less than half a mile. The main ridge ends very suddenly just to the east of the summit, with a 700ft drop down Gamlin End, and although Seat probably counts as a foothill of High Crag, this big drop really does act as a full stop. From Buttermere valley High Stile and High Crag are almost twins, pushing their dramatic craggy northern ridges into the valley and looming over the lake. As with most of this range, the Ennerdale face is less dramatic, and from the western part of the valley, where Gamlin End isn't really visible, the fell can be harder to pick out of the long line. The ridge walk west to High Stile is one of my favourites - the ridge is wide enough to feel safe all the way across, but narrow enough to offer great views down into Burtness Comb to the north and the upper reaches of Ennerdale to the south. The view into Ennerdale used to be dominated by vast hordes of conifers, but in recent years many of these have been felled and the Wild Ennerdale project volunteers (including myself) have planted thousands of native deciduous trees and junipers in the area. Burtness Comb is one of the rock climbing hot spots in the area, and the visitor to High Crag can often watch climbers on the cliffs of High Stile and on Comb Crags as they make their way up. There are only two sane ways onto the summit of High Crag, and even one of those isn't that pleasant! The best route to the top is along the splendid high level ridge from High Stile, a walk of just under a mile from summit to summit. The second route comes up Gamlin End, and involves a prolonged slog up a steep scree slope. There is a decent path for most of the route, but that doesn't make it any less steep or any less awkward. This is best kept for a route down. Our walk along the High Stile range visits High Crag before dropping down Gamlin End. High Crag has a rather less dramatic summit than one might expect from a difference. Although there are steep drops on all three sides of the triangular summit area, the top itself is surprisingly flat, with gentle slopes leading to the High Stile ridge and to the rocks above the northern face. 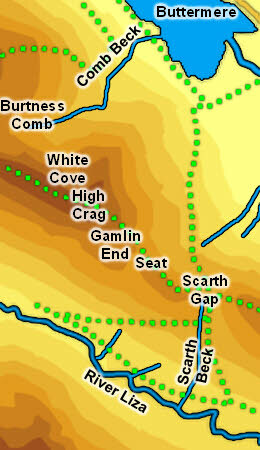 Only to the east, and the start of the drop down Gamlin End, is there a sudden edge. Even so the summit plateau is fairly small, and the views are impressive in every direction. The River Liza forms the southern boundary of the fell, flowing from east to west along its foot. On the Ennerdale side Scarth Beck forms the eastern boundary, while the western boundary is rather less clear. On the Buttermere side Comb Beck forms the western boundary, flowing out of Burtness Comb into Buttermere. Several nameless becks flow out of Scarth Gap south-east into Warnscale Beck, when flows north-west past the foot of the fell and into Buttermere. High Crag has no tarns.